Adult bed bug (Cimex lectularius) adult feeding. Permission for public use by Nakrecki, P.
While it was previously thought that bed bugs were unable to transmit disease to humans, recent studies that suggest bed bugs may be able to transmit Chagas disease to humans (1). Entomology Today cited studies that looked at bed bugs (Cimex lectularius) that consumed blood infected with T. cruzi, and found that the parasite remained alive, for up to 97 days in the bugs bodies, when studies ceased. Further, the parasites persisted through bugs developing from one nymphal stage to the next. 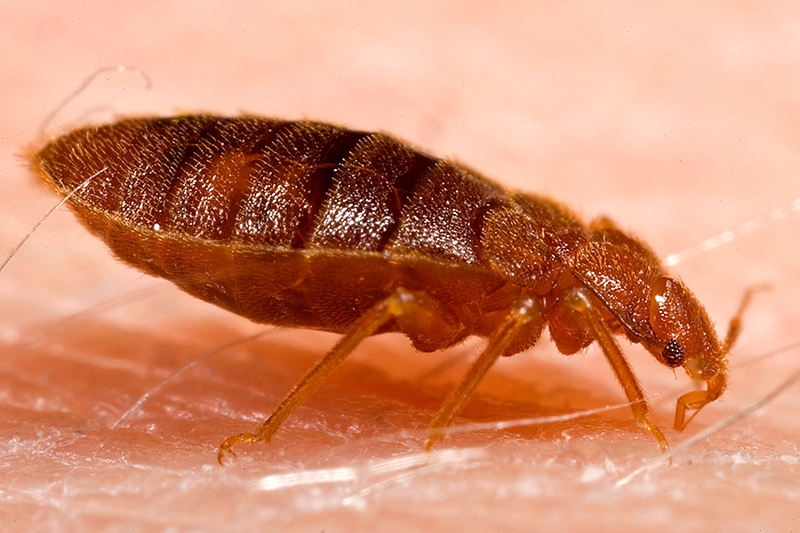 In effect, while the bed bugs feed on blood, there is a risk that they transmit disease to their animal hosts. An earlier 2015 study at the University of Pennsylvania School of Medicine showed that bed bugs transmitted diseases to mice in the lab (3). Chagas disease, aka American trypanosomiasis, effects as many as 8 million people in Mexico, Central and South America, and is caused by a parasite named Trypanosoma cruzi (also known as T. cruzi). According to the Centers for Disease Control and Prevention (2), Chagas disease cases have occurred in USA, but up until now, control measures focussed on preventing transmission of the infection through transplants, blood transfusions and from pregnant mothers to their babies. Bed bugs are on the rise, cause suffering, anxiety, and significant loss to property, sometimes hitching a ride on international travellers. While more research is needed to quantify the real-world risk of bed bugs transmitting diseases to humans, canine bed bug detection teams, pest management professionals, and health professionals may benefit from continuing to monitor this emerging area of research. Photo: Cimex lectularius adult feeding, permission for public use by Nakrecki, P.